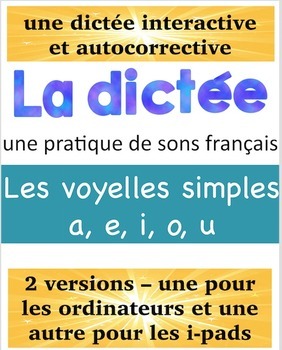 This file provides two different formats for students to practice French spelling (dictées) independently and interactively. There are 10 words to practice and one sentence using the words in context. The first file is an interactive PowerPoint. The student listens to a word, writes it down and then pushes the right cursor to self-correct. The second file is an epub which can be opened in i-books. Again students can listen to the word, write it down and then self-correct. Both files are edible, the first in PowerPoint and the second in the Book Creator app.